When a fellow volunteer at the food pantry asked me to make cookies for her sweet baby's baptism, I was so honored! Kara is one of those really organized people. She even provided me the cookie cutter, just like she did when I made cookies for her sister's 40th birthday party. Come to think of it, Kara, would you like to be my personal cookie cutter shopper? 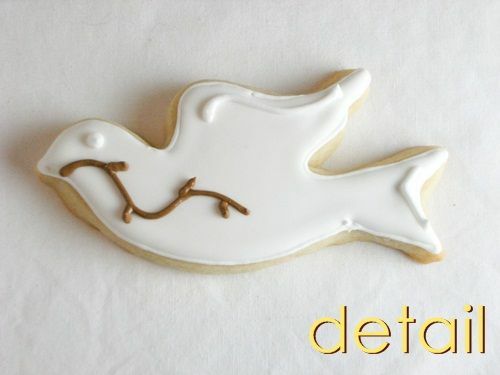 Anyhoo, back to the cookies...the napkins for the party were a pretty yellow with a dark brown cross, so we added a branch for the dove to carry to incorporate those colors. 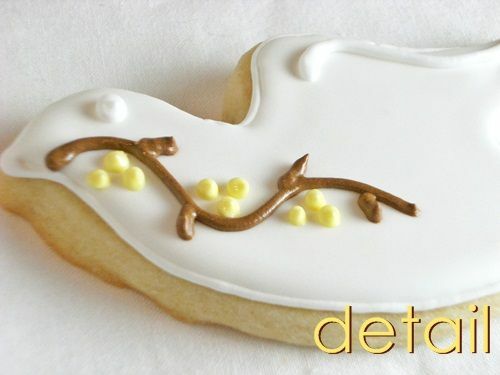 Using a #2 tip, outline the cookie in white royal icing. Thin the white icing (reserve a bit for later) with water, a little at a time, until it is the consistency of thick syrup. Cover with a damp dishtowel and let sit several minutes. Stir gently with a rubber spatula to pop any large air bubbles that have formed. Transfer to a squeeze bottle. 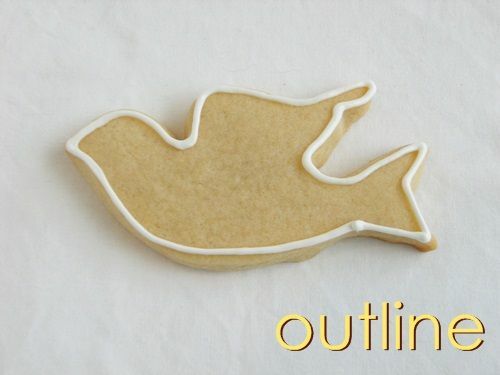 Fill in the outlined cookie with the flood icing. Use a toothpick to spread into sides and corners. With the reserved white icing and #2 tip, add detail on wings, tail and add an eye. Using another #2 tip, pipe the branch in dark brown. With a #1 tip, pipe yellow flowers/berries on the branches. Thank you, Kara, for letting me be part of your baby's big day! If you haven't already, be sure to enter the giveaway going on right now! You could turn YOUR blog into a book! 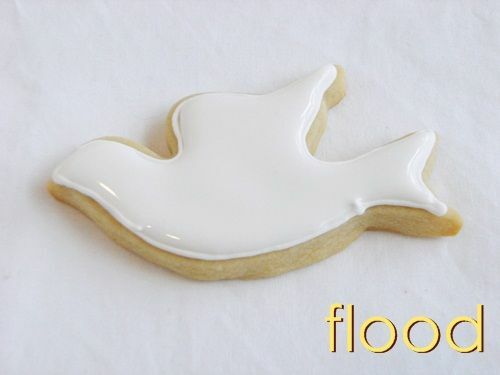 I love to make sugar cookies, but have never done the "flooded" icing. I want to give it a try. Your cookies always look so pretty using this technique. Love the doves. So pretty. Love & blessings from NC! Yet again, your cookies are perfection! You are so sweet to always be making cookies for people AND donating at the Food Pantry. Someone should be making YOU cookies! Thanks! Did you just wait 1 hour since you flooded with white icing to when you piped with the brown one? Didn't the brown icing bleed into white icing as time went by? 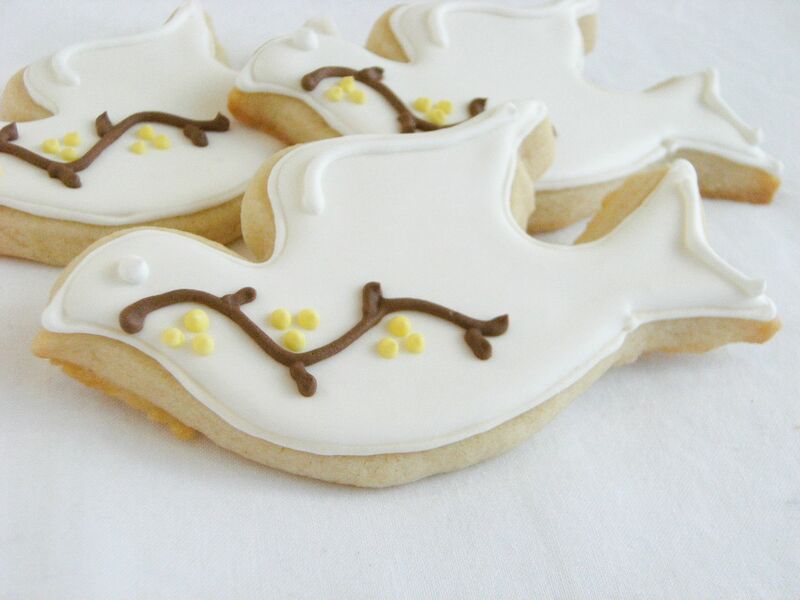 Prettiest baptism cookies I've ever seen. Simple, elegant...beautiful job! Those are lovely! They look perfect. 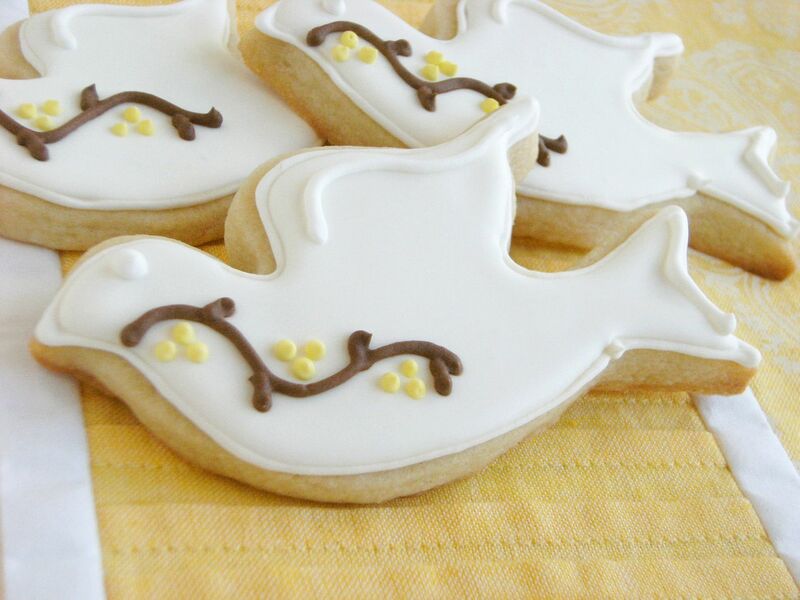 The idea to use a dove for a Baptism cookie was wonderful. You made a beautiful cookie Bridget. Kara must have loved these. wow these are so beautiful! You are so talented! Pretty, pretty, pretty. 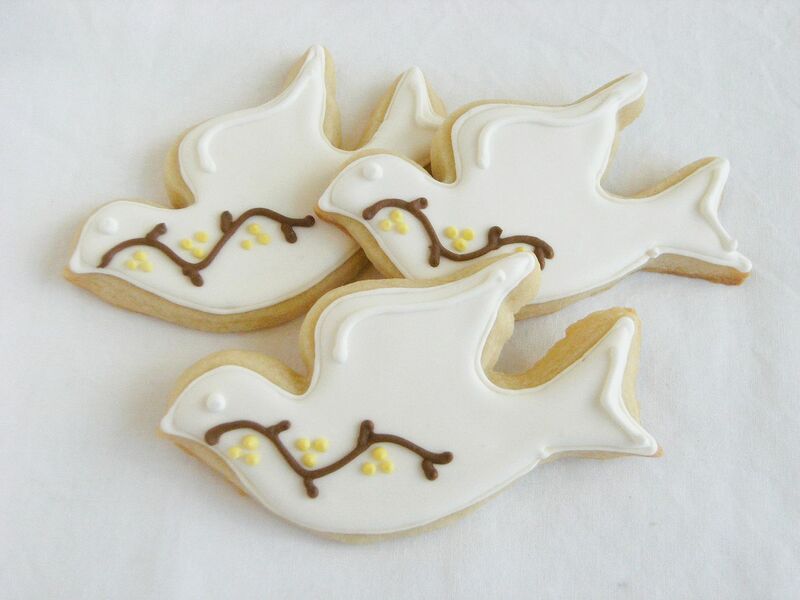 Love the idea of using a dove for a baptism and yours are simply elegant Bridget! Nicely done (yet again). these look sooo pretty. i love them! Everytime i come to your site i am so impressed with the work that you do. I have a giveaway going on, don’t miss out, it ends 8/27 and it's for all the wine enthusiasts. You have quite the cookie cutter collection, Bridget! These are just so elegant and simple. Your design is gorgeous. Great job! How far in advance do you make your cookies? Can they be frozen and thawed just before decorating? Beautiful COOKIES! The details remind me of Japanese designs... love them!! Beautiful - would be great for Easter as well. 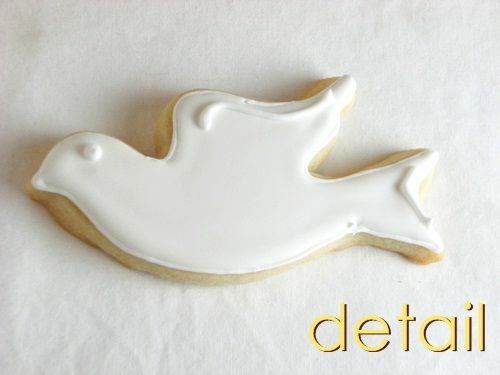 Those are the prettiest dove cookies I've ever seen? wow!! im convinced, when it comes to cookies, you have a gift! they look amazing, and im pretty sure they taste just as good! Those cookies make me feel at peace. So pretty! I have tried repeatedly to decorate cookies, but I can never get them to look so beautiful. I am so envious of people like you that can turn a plain cookie into a piece of art. These are so elegant and sweet. I will ahve to get this cutter right away. I love these. I really do!! So simply elegant and beautiful!!! These cookies are just precious. I love that you volunteer. You are such a sweet woman. These are beautiful, so simple and elegant! Those are super pretty Bridget. I love the color combination. Well if those aren't the sweetest little cookies. I know they made the baptism so special! I wish you lived next store to me so I could just watch you all day! Lovely Lovely Sweet Sweet Cookies! Love to try this.Looks deliciously good.